Martin School is lucky to have a PTO that provides us with a subscription to BrainPop. In the 4th grade and through 8th grade, Brainpop is the next level up from Brainpop Jr., which some of you may be used to from 3rd grade. I use Brainpop in the classroom as well as assigning Brainpop for HW. My students will be very familiar with the school user name and password so that can access Brainpop at home. Below I will add links as we learn about various topics. Some of these videos we may view in school, some may be assigned as HW and some may be posted just for those that want a little extra information or a good review. For those families not familiar with Brainpop, its a great site where kids can learn accurate, age-appropriate information about many topics ranging from the sciences, math, English, social studies, engineering & technology, health, and the arts & music. 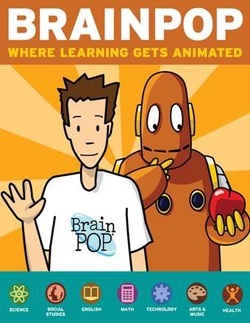 Brainpop helps kids learn through videos, games, and quizzes. It is engaging, fun, and reaches all levels of learners. Check out the links as we work on various topics!